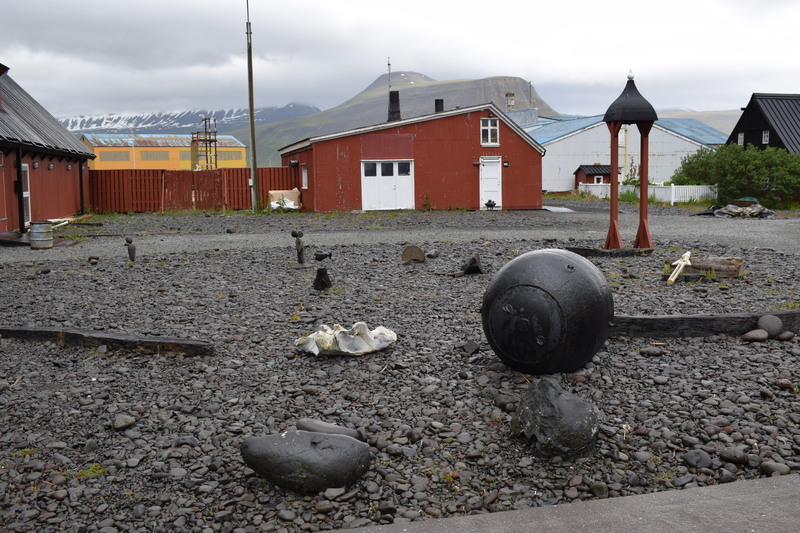 #Isafjordur, #Iceland – I’m still traumatised! Now I booked this after deciding that some adventure was needed during the cruise. I would enjoy the sunny landscape of a beautiful fjord and admire some Icelandic scenery up close. Well, this is how I sold it to myself. When I sat down for breakfast, little did I realise that I was going to entertain half the dining room by informing them that the delights of that day was going to include fjord kayaking. “Have you been before?” a shocked lady asked. When I told them I hadn’t, and was somewhat concerned about my safety and staying dry, they all screeched with laughter and one kind gentleman said that I could always do the ‘kayak roll’ (https://www.youtube.com/watch?v=YLxxI4GDE80), if I fell in. This was not helping although they were friendly and fun, but I was beginning to panic. What was I thinking? I waved to Pete, our dinner and pub pal, and he helpfully did a mime of sailing along and then falling in. Ha, flipping, ha. Everyone laughed some more. I smiled, through gritted teeth, panic mounting. Nothing is insurmountable, I told myself. It will be fine. No, I didn’t believe me either. 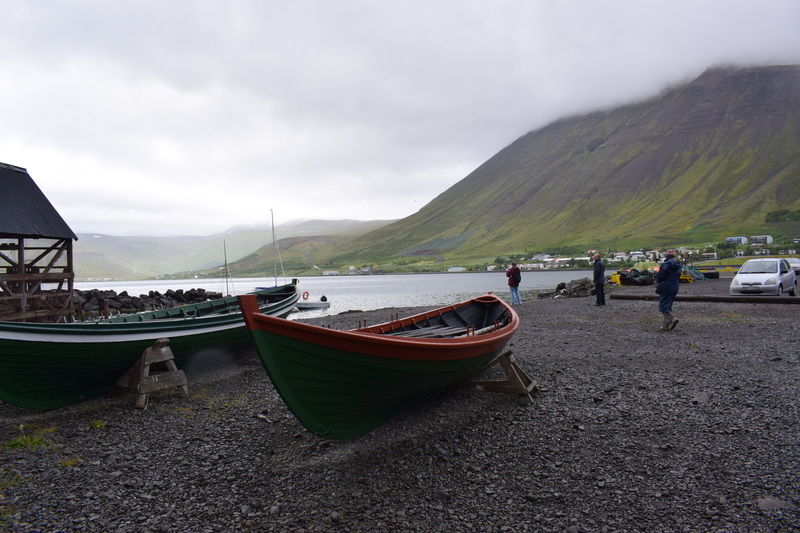 After breakfast, we decided to have a look around Isafjordur because the great event, was later during the afternoon. To be honest, there was not a lot in the town, but we wandered around, took some photos of the dramatic fjord and accompanying landscapes including the old town wooden houses with corrugated tin roofs built by fishermen in the 18th and 19th centuries, and the maritime historical pieces and fishing boats. Anyway, we met out Kayaking leader and strolled along to the fjord for the great event. My goodness me, what we didn’t have to put on. Trousers (dry suit), coat, life jacket and then the skirt which attaches to the kayak! Oh, and then we all had to sign a disclaimer. Eventually we climbed in the kayaks, had a safety talk, then were pushed into the water. Oh my goodness, it was even more stressful than I imagined. I was terrified. In fact, I wanted to get straight out again, but “that would interrupt the class” so I said I would carry on. After that panic, it did improve and my husband was quite proficient at steering (from the back). We all kept together and paddled around the surrounding area. Others got behind, but we, probably because of my husband’s efficient paddling and steering, were the front runners, so to speak. The actual kayaking was about two hours long and we did have quite a good view of the majestic fjord of Isafjordur in West Iceland and admired the natural surroundings and savoured the serenity of the area. Yes, it was an unforgettable experience and the best part was being dragged ashore and removing oneself from the kayak knowing one did not get very wet and stayed safe. So, who can guess what we did next? “I need a drink!” Yes, we went to a local bar a paid a fortune for a pint. It was worth it, I can tell you. Never again. Oh, and for the remainder of the cruise, I had people coming up to me asking about how I got on with the kayaking. Famous at last or should that be infamous? Didn’t realize kayaking could be a dangerous feat! You’re a survivor! Excellent! I’m not sure if that was available on our cruise or not. I did hear about some people who were on a boat trip to another island who had to sit at the back of the boat and who got drenched before the excursions n had really begin – rain falling, rain being whipped off the back of the cabin roof, and spray rising from the sea. 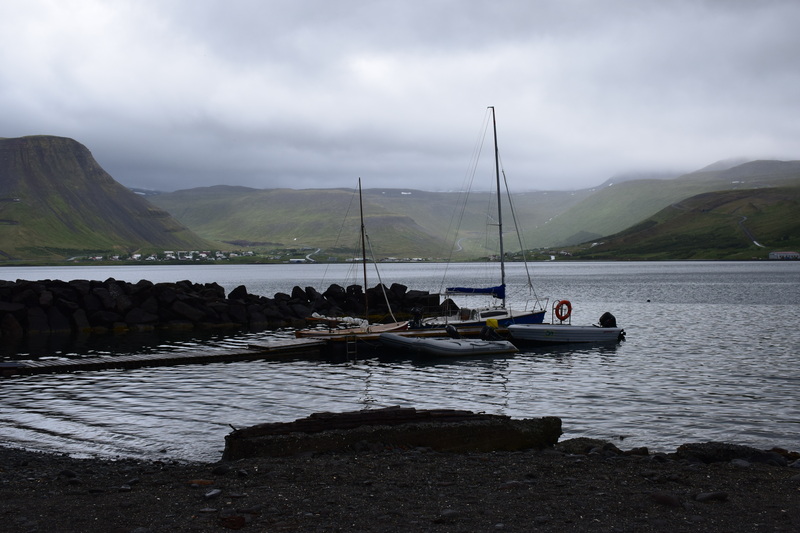 We just walked around Isafjordur in the rain and cold wind for a couple of hours. We did visit the Cultural Centre (library and art gallery) and we had coffee and cake in a local café-bar, and then went back to the ship. It’s spectacularly located, but there’s not a lot actually there, we thought.